A lot of managers believe they can differentiate their products in order to avoid the competition that ends up driving returns on capital to average levels. But this is incorrect, according to the authors. Differentiation is not free. Investments must be made in advertising, product development, service, distribution and other functions. As long as there are no barriers to entry, competition can make the same investments. The authors cite Mercedes Benz as an example. It is a differentiated product, but competes with a bunch of other differentiated products (luxury cars) such that its returns on capital are just normal. Competitive advantages are only present when there are barriers to entry, according to the authors. There are three kinds of advantages, two of which are discussed in this chapter: supply advantages and demand advantages. A company that can keep costs lower can keep competition from entering (a supply advantage). 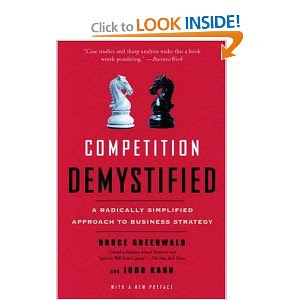 Even if new competitors do enter, the incumbent can lower prices until the entrant can't match. This advantage could be the result of lower input costs or proprietary technology, including patents. Xerox, Kodak, Polaroid and many pharmaceutical firms have benefited from such advantages over the years. The problem with patents is that they expire, and the problem with know-how is that it can be hired away and can be copied eventually or surpassed by new technology. In the long-term, "everything is a toaster" (where there is no premium on capital to be earned). Demand advantages come from a firm having customers that new entrants don't have as much access to. This can be because of customer habit (e.g. this occurs in the soft drink industry, but not to the same extent in the beer industry for whatever reason), high switching costs (e.g. software that requires personnel training) and high search costs (e.g. where personal experience is the best method of selection, such as when choosing a doctor). While these advantages can last longer than supply advantages, they have their limits. New customers, by definition, are unattached. Old customers leave, mature and/or die. Depending on the industry, this could be a short or long life-cycle. Heinz and Coke are examples of life-cycles that span generations, whereas teen apparel would have a short cycle as new, unattached teens are created every day while older teens move on.